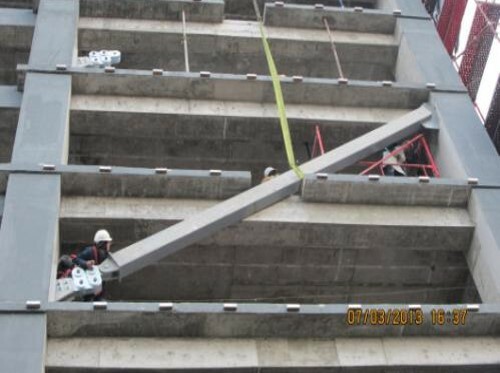 Diagonal Bracing can be installed with all the advantages of the Damptech's rotational friction damper, including the high performance hysteretic damping, a maintenance free system that is also adjustable for design flexibility, and flexibility to accommodate future building demands. The damping performance is predictable and the structure is comparable to a BRBF in design procedure and design results. When a lateral external force excites a frame structure with a large force, the top of the frame structure starts to displace horizontally due to this force. The bracing system and the frictional forces developed between the frictional surfaces of steel plates and friction pad materials will resist the horizontal motion and dissipate energy. When the frame structure moves horizontally, the diagonal reaches design capacity without buckling, since the damper is designed to move at this design force.